Trojan International Boats – We Invented Cool ! It is hard for many current boaters to remember, but back in the late 1970s and early 1980s many “cabin cruisers” and express boats were still very much designed and engineered out of the 1950s, which is to say, boxy and squared off. 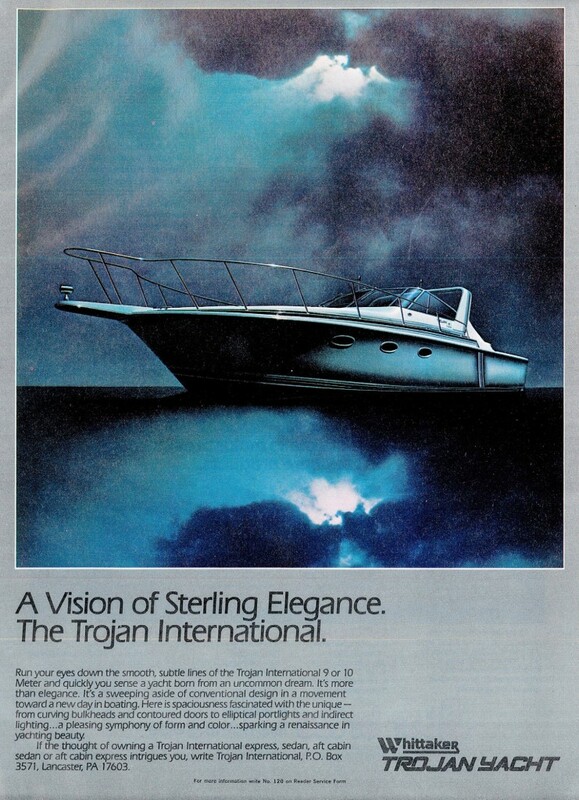 When first introduced in 1981, Trojan’s International series of boats were truly groundbreaking. Inside there were rounded edges and curves instead of angles, plush fabrics, sensual color schemes, hidden trash cans, push button-curved doors and molded in ductwork. Outside a daring new design, tremendous deck space, bold hull graphics, curved glass, opulent features and a bold new look. Underneath it all were woodless fiberglass stringers, a vacuum bonded hull with liners, built in water tanks and a side at-waterline exhaust system, all riding on a revolutionary new stable dry ride hull design that garnered raves from reviewers. Decades after introduction, these innovative and initially radical concepts continue to influence marine design. These vessels still to stack up well against new offerings and remain one of few boats worthy of a repower or complete refit. They are well recognized and represent an outstanding value in the marketplace that far exceeds market price. Today the great majority of American express cruisers look as they do because of the individuals and risk takers at Trojan who set the course many years ago. The Trojan name continues to be a good one, and on the dock the “talk” is positive for these well designed and engineered vessels built in Lancaster Pennsylvania by Amish craftsmen from 1949 to 1992, when the brand met it’s demise, along with many others as a result of the federally imposed Luxury Tax. We may be an orphaned brand, however of the hundreds of others no longer produced, not one brand has the following, support, or enduring reputation of Trojan. Decades from now when most of the 1981-1992 brand x competition will be scrapped or forgotten most of the International Series will still be in service as they continue to be recognized as being worthy of investment and refitment. This informational website has been established for posterity; to establish a legacy recognizing the dynamic personalities responsible for taking the risk for a small company in rolling out what was at the time, a very forward thinking, radical design, like nothing the marine industry had ever seen. Additionally this site is an asset for Trojan International owners and others interested in the documentation, maintenance, upkeep and overall enjoyment of these unique vessels. There is a separate website that provides great information, brand specific parts, and an active forum for All Trojan products. Check out www.trojanboats.net for more information.